Cushman & Wakefield, the real estate company that’s handling the sale of the property, has set up a website to collect offers for the land between now and 5 p.m. on July 20—two weeks from today—after which Brodsky will presumably make a decision on the matter. What this ultimatum means for the negotiation process is anyone’s guess—Paul Massey, the president of the Cushman & Wakefield, and Brendan Maddigan, the project director, did not respond to separate calls seeking comment on the website. However, Stephen Chesler, co-leader of neighborhood activist group Friends of Bushwick Inlet Park, says the intended message of this call for offers is loud and clear. Brodsky is hoping that the property will net him $325 million and claims that there are already offers on the table from interested parties. Chelser and the other Friends of Bushwick Inlet Park are still hoping the owner “does the right thing” and takes the city’s offer. Even after Brodsky’s July 20 deadline for offers passes, he will still have a couple weeks to change his mind before the city’s offer expires on August 8. 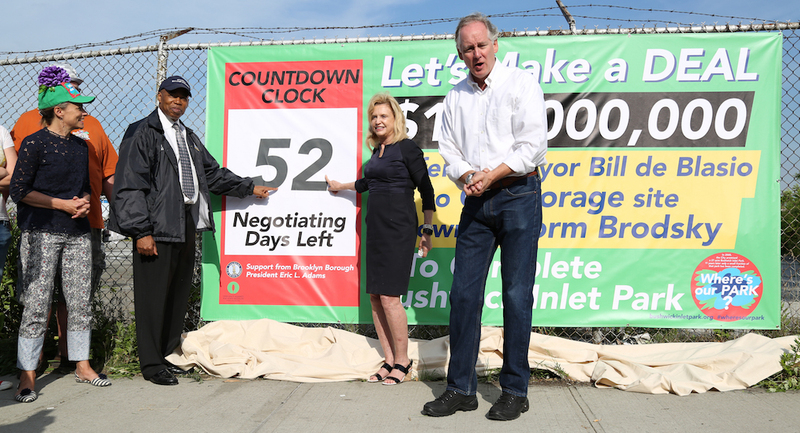 In order to make sure Brodsky doesn’t sleep on this deal, the Friends of Bushwick Inlet Park are going to be holding a “sleep-in” this Saturday on the property to mark the halfway point of the countdown banner they put up last month. The public festivities, from 7 p.m. to 10 p.m. on Saturday, will feature talks from community members and representatives, including Brooklyn Borough President Eric Adams and New York Congresswoman Carolyn Maloney, as well as live music and food. After that, Chesler and the other activists will stay overnight in tents and sleeping bags on the asphalt outside the Citistorage warehouse as a way of making a point. With a forecast of daytime thunderstorms and a 91-degree high, it’s not going to be as comfy as, say, The Wild Honey Pie’s forthcoming camping trip, but hey, it’s local. And it’s not like Camp Rockaway ever happened. “The fact that we’re camping out on asphalt in what should be a park, it heightens the sense of irony and the sense of urgency,” Chesler said.